More than 100 voices & visionaries - "SPARKS OF GENIUS" - are here to inspire you to discover, honor & share YOUR genius with the world. 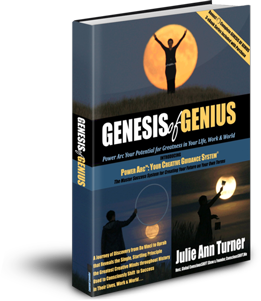 Join us here for 21 DAYS OF GENIUS from Oct. 3-23 - and for the GENESIS OF GENIUS Book Launch on Oct. 24. > Simply scroll down below to view ALL the "21 Days" Quotes & Insights! *We're featuring a sampling here of the 100+ Insights from our "SPARKS OF GENIUS" - all of which will be shared in our one-of-a-kind, collaborative SPARKS OF GENIUS eBook - available as a bonus to those who buy GENESIS OF GENIUS on Launch Day, 10/24. 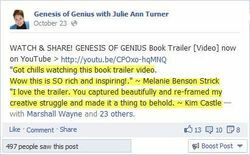 ... and be sure and add your comments to our GENESIS OF GENIUS Facebook page! P.S. If you want to subscribe to the 21 Days of Genius blogposts, click here.